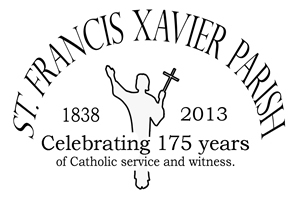 St. Francis Xavier Parish is a wonderful welcoming Family of Faith located in McKean , Pennsylvania. As the People of God, we rejoice in doing our very best to live and love like Christ as a community! We are committed to loving God, loving others, and making disciples. Founders, long-time parishioners, newcomers, and those visiting the area are all welcome. May the Lord’s every blessing be yours today and always! Tuesday, Wednesday Thursday at 7:30 a.m. Communion Services on Monday & Friday 7:30 a.m.
Monday thru Friday 9 a.m. to 4:30 p.m.
Parish Office is located on the west side of the Church.